Most danios come from Asia. Fish of the danionin family are schooling fish. Usually danios are very suitable for aquarium keeping - a proper tank size provided. Similar to most aquatic plants, danios prefer soft and acidic water and moderate temperatures - even below 25°Celsius, so keeping them at room temperature without an extra heating unit really is no problem. Due to their small-sized mouths, food of the right size is vital. Fine powdered foods or very fine granules are an option as well as live food such as freshly hatched brine shrimp naupliae. 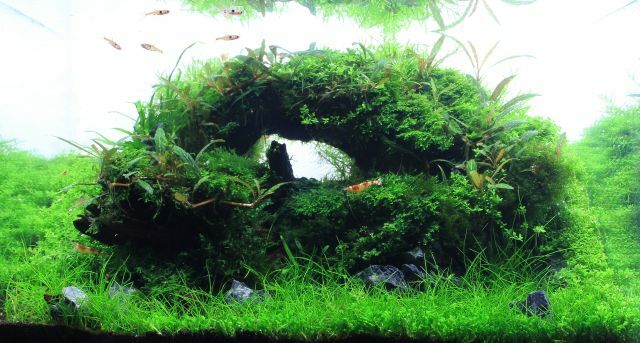 In the following overview, we’ll list some of the most popular danios suitable for a planted tank. 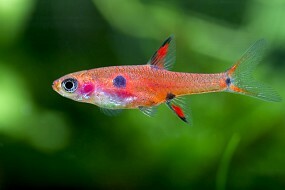 This small fish (maximum 2.5 cm) is commonly known as the exclamation point rasbora and can easily be found in the trade. In contrast to many other dwarf danios, which are more reddish in color, Boraras urophthalmoides has a golden-red and a black longitudinal stripe and a tiny spot on the tail root (visible especially well in the header photo). The exclamation point rasbora is a peaceful swarm-fish, which should not be socialized with bigger fish. If the group is sufficiently large, you can observe their pretty schooling behavior in your aquarium. An aquascape with Boraras maculatus. Copyright by Aram Schneider. We have summarized these various dwarf danios into one paragraph because keeping conditions and their color patterns are very much alike. Other, similar species are commercially available (Boraras micros, Boraras naevus). All of those danios are orange-red in color and have black marks. When the fish feel comfortable, the red colors will get really intense. Boraras brigittae is characterized by a black longitudinal stripe on red, Boraras maculatus has one bigger and several smaller spots on its red body. Boraras merah is distinguished by spotted, reddish/orange patterns with a black dot in their middles along its lateral line. 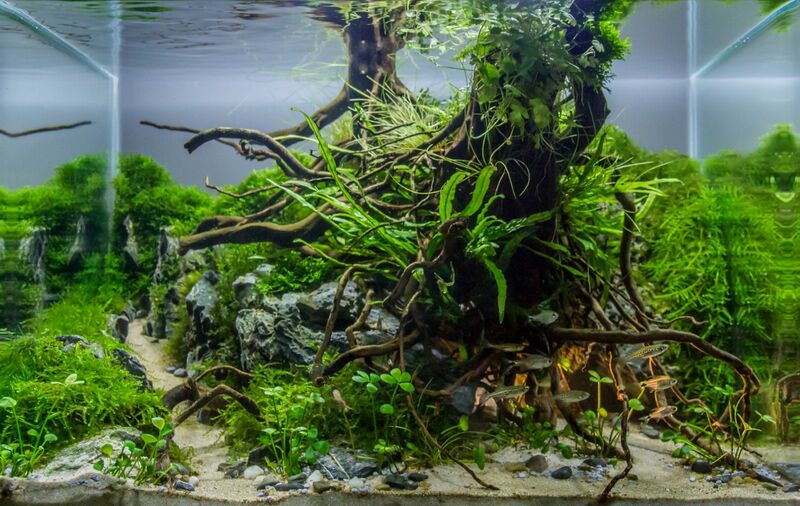 A great aquascape with Boraras brigittae. Copyright by Marcel Dykierek. Danio margaritatus is a small fish with a steeply rising popularity. Celestial pearl danios are social, reach a length of about 3.5 cm and are of a rather squat build. 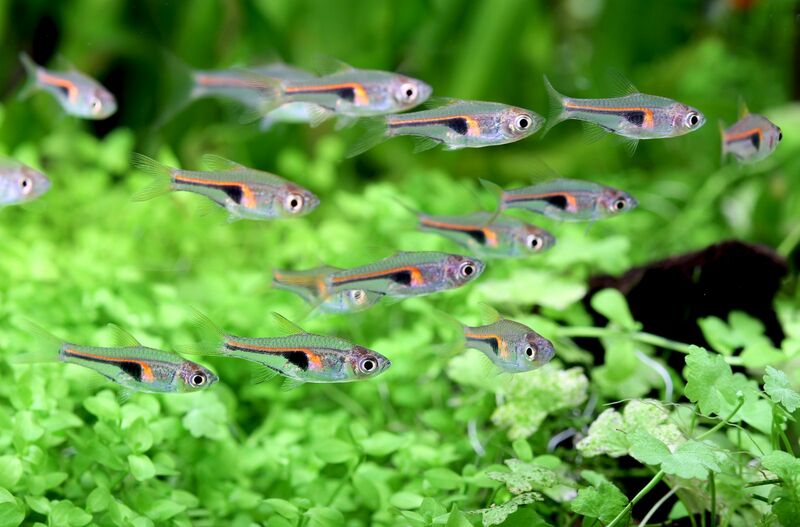 Danio margaritatus are very lively fish, which add a bustling effect to the aquarium. For that reason, these fish should be kept in somewhat larger aquaria (> 54 liters). In their natural habitat, Lake Inlé, the water is rather cool and slightly alkaline. In this regard, Danio margaritatus can easily be kept in harder tap water, where it will even reproduce. 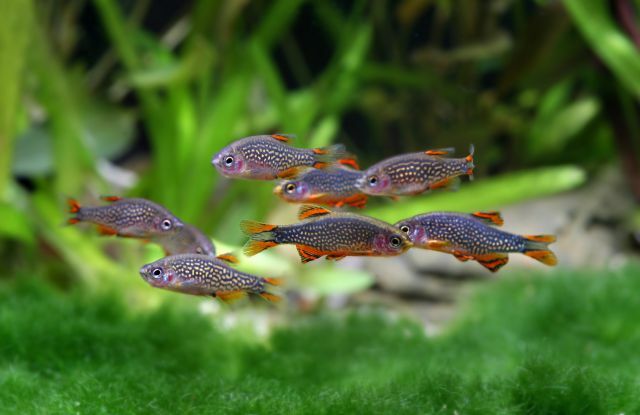 These fish display an interesting social behavior, the showmanship of the male celestial pearl danio is impressive! Relatively similar in its demands is Danio erythromicron, which was originally discovered near Lake Inlé in Burma, just like Danio margaritatus. However, this fish has a slightly different coloring, with blue and yellow stripes, and it is less readily available commercially. 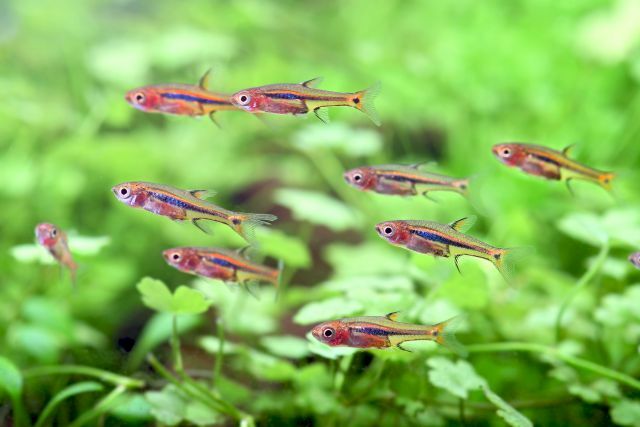 Danio margaritatus and Danio erythromicron can hybridize and should therefore not be socialized. With a black, wedge-shaped mark on its side, Rasbora espei looks quite similar to the Harlequin rasbora Rasbora heteromorpha. The rest of its body is transparent, with a golden-orange stripe. 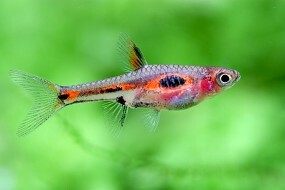 With a maximum size of 3 cm, Rasbora espei is a bit smaller than the Harlequin rasbora. An enthusiastic swimmer and schooling fish that needs the corresponding swimming space. 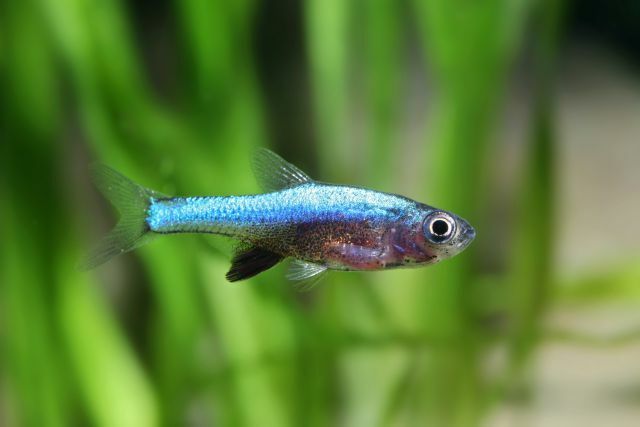 Its spawning habits are particularly noteworthy since Rasbora espei deposits its eggs on the underside of the leaves of aquatic plants. Danio tinwini in a mixed swarm with Reed or Veilfin Tetras. Copyright by Aram Schneider. 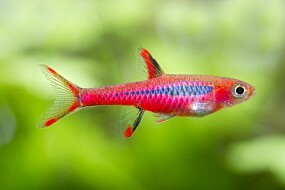 Sundadanio axelrodi is also known under its synonym Rasbora axelrodi. This danio is of relatively small size, too - only 2 to 3 centimeters. Its main color is a shimmering, silvery blue, but green and red variants are available as well. Sundadanio axelrodi is a pretty shy fish that prefers hiding places and retreats such as aquatic plants or decoration. It likes moderate lighting and just like the other danios, Axelrod's danio should be kept in a larger group of conspecifics. unmarked pictures: Copyright by Chris Lukhaup.